Fine gloves go well with just about any look you can imagine. Knights, kings, warriors, swordsmen, soldiers, brigands, bandits, and more can all enjoy the look of good gloves...and these Black Suede Leather Gloves are just that. With the advent of fire arms, the need of heavy armor for hand to hand combat was reduced. Swords grew smaller and lighter. Hand guard grew out of quillions, and gloves came out from beneath gauntlets for hand protection. 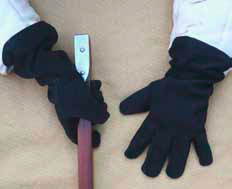 These heavier suede gloves suit that purpose. Although the use of gloves go back to great antiquity, a gauntlet, which could be a glove made of leather or some kind of metal armour, was a strategic part of a soldier's defense throughout the Middle Ages. This page was last modified on 4 May 2014, at 15:33.